2008: He soloed with the Olympic Committee Symphony playing Spring from Vivaldi's four seasons. 2010: He joined Sacramento Youth symphony training with various teachers from different locations. 2011: He received 1st prize in the Hong Kong International Violin Competition. 2012: He was the youngest contestant be invited to the Tchaikovsky competition, youth division, in Switzerland. 2013: He was accepted to the Central Conservatory of Music Middle School, and was also invited to their festival. 2014: He was invited to Kremlin. 2015: He placed second in the Japan, Europe and Asia Youth Violin Competition. 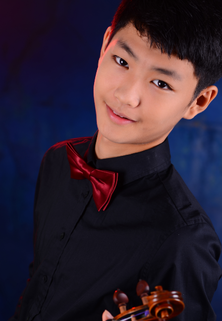 He recently won 3rd place in the Mozart International Piano/Violin Competition in the teen category.